I originally create Readings to make Eijiro more useful. However, I've since incorporated Readings directly into Eijiro. If you have my improved version of Eijiro, you don't need to use Readings with it. However, I continue to include Readings with my system because it may occasionally be useful with other dictionaries or text from other sources. If you don't have my improved version of Eijiro, then you may find Readings more essential. This is a very simple dictionary with two very important functions. 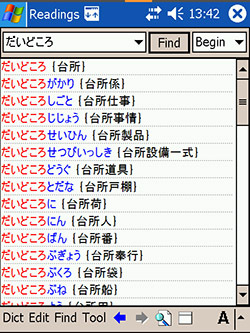 With Readings, you can quickly find the pronunciation of any Japanese word. 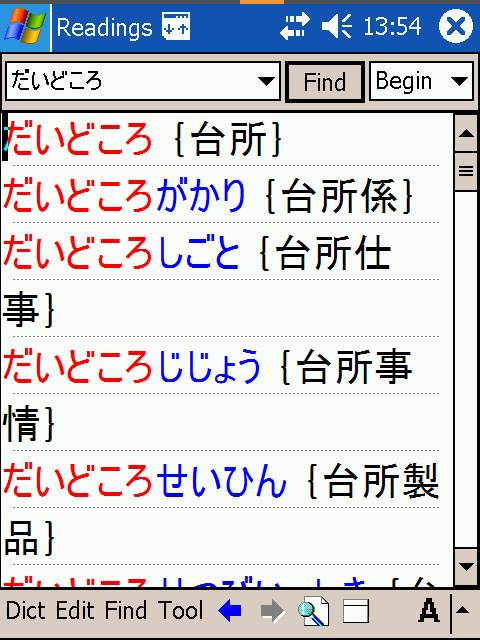 In the stock version of Waeijiro (not in my improved version), the Japanese-to-English part of the Eijiro suite of dictionaries, all Japanese words that are normally written in kanji appear ONLY in kanji. 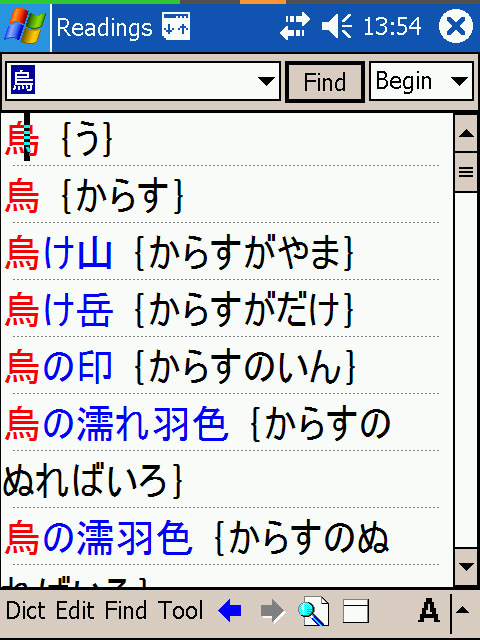 To look up such a word, you must enter it in kanji--by how it's written, not by how it's pronounced. 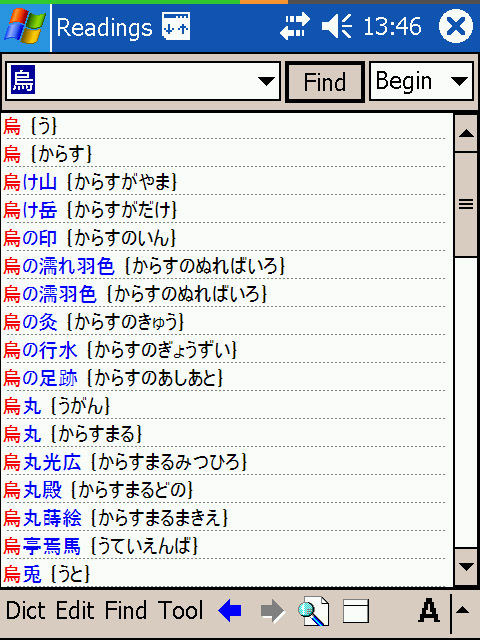 With Readings, you can easily look up a word in Waeijiro even if you can't write it in kanji. Readings, although simple, is huge. There are about 1.4 million entries. Here are three typical results screens in Readings. Please note that the actual PDA screen is much sharper than this, especially for VGA PDAs like the Axim X50V (see below); click an image to see the full 480x640 pixels of the Axim screen. Since the list of results and the actual results are quite similar, you can tap the Splitscreen icon to make the list go away so the main results fill the entire window, as shown. Enter roman letters to find Japanese versions of words and phrases that have both Western and Japanese spellings. After this, if you want more information on the word--like a definition--you could choose another dictionary from the "Dict" menu in the bottom left corner to automatically look up the word in that dictionary (you don't have to go through the steps above again). And if you want to go back to where you started, just tap the left arrow in the toolbar at the bottom. 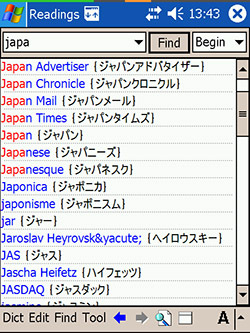 If you want to look up a word from another program (e.g., email or WWW), just copy it into the search window. Of course, you could also switch to readings via the "Dict" menu at the bottom left and then simply enter any word you want to look up in the search window at the top. 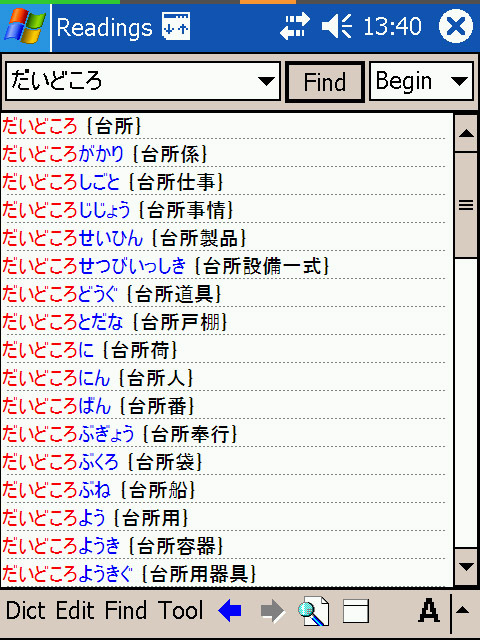 You can enter a word in hiragana to find the kanji of all words with that pronunciation, and you can enter a word in kanji to see how it's pronounced. 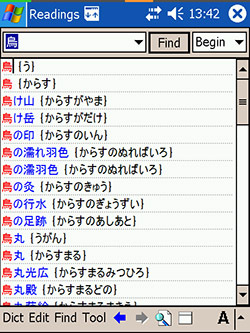 Select the kanji spelling of the word, press and hold it to bring up the action window, choose "Specific Dictionary," then choose "Waeijiro"
For more information on how to use the EBPocket software and the PDA itself, see the general documentation. Click here to download the Readings dictionary: in EPWING format; in PDIC format. Here's a quick usage tip (see how there's only one tip necessary? Isn't that nice?). If you find searches in Readings are running slowly, be sure you haven't chosen "Full" as the search type (the search type box is the one on the upper right that says "Begin" in the screenshots above). While full searches can occasionally be useful, usually it's not what you want and it can take just short of forever. If even Beginning searches are running slowly, choose "Exact" for almost instaneous results. Note that I've sized the images above to appear about the same physical size as the Axim X50V's screen (depending on your monitor, of course); however the actual Axim screen squeezes a full 480x640 pixels into that space, so it's much sharper and easier to read (more pixels in the same size=higher resolution).